The experts’ record is so lousy at spotting key technologies ahead of time that there is little chance they will see the killer gadgets and applications of 2020. If you had asked this question a decade ago, no one would have predicted the iPhone. 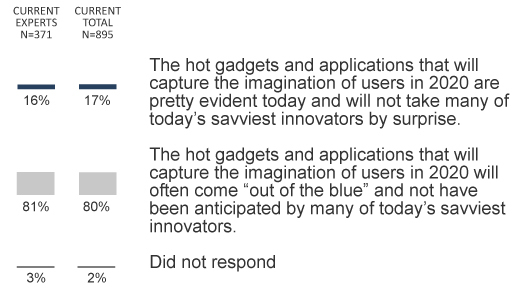 If experts could already see them today, they really wouldn’t be ‘out of the blue’ innovations. There are basic trends evident now and some groundwork that has been in place for years that will yield innovation. The internet of things is being built. Sensors will proliferate. One of the big reasons experts do not have a strong sense about the innovations of the future is that the environment of technology is still taking shape. Lots more bandwidth and computing power – for less cost than today – will spur changes that cannot be foreseen now. Some trends are clear: Mobile connectivity and location-based services will grow in the next decade. Other hot items will include: bigger/thinner TVs, 3D displays, “consolidated,” all-purpose gadgets and apps, speech recognition. It’s the unintended consequences that really surprise. “Indwelling” technology is the kind with the greatest impact. It takes a generation to figure out which technologies have real impact and which are just fads. Personal data clouds will emerge. Brain interfaces might be on the horizon. Look to emerging markets for “out of the blue” changes. The health care arena will be a hot growth area. Part 1: A review of responses to a tension pair about whether Google will make people stupid. Part 4: A review of responses to a tension pair about the evolution of the architecture and structure of the Internet: Will the Internet still be dominated by the end-to-end principle?